This recipe has a KICK to it if you use the suggested red pepper (the hot kind). If you prefer a more mellow version just omit the hot pepper or substitute it with sweet pepper. 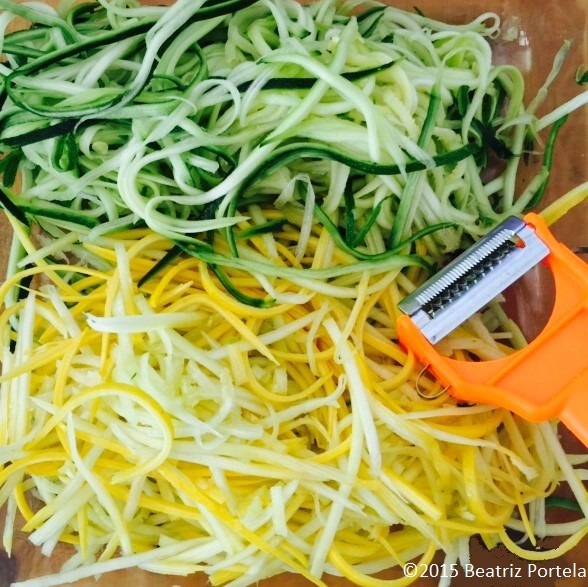 To make the pasta, use a Peeler or Food Processor to julienne the squash, or use a Spiralizer. Makes 4 servings. 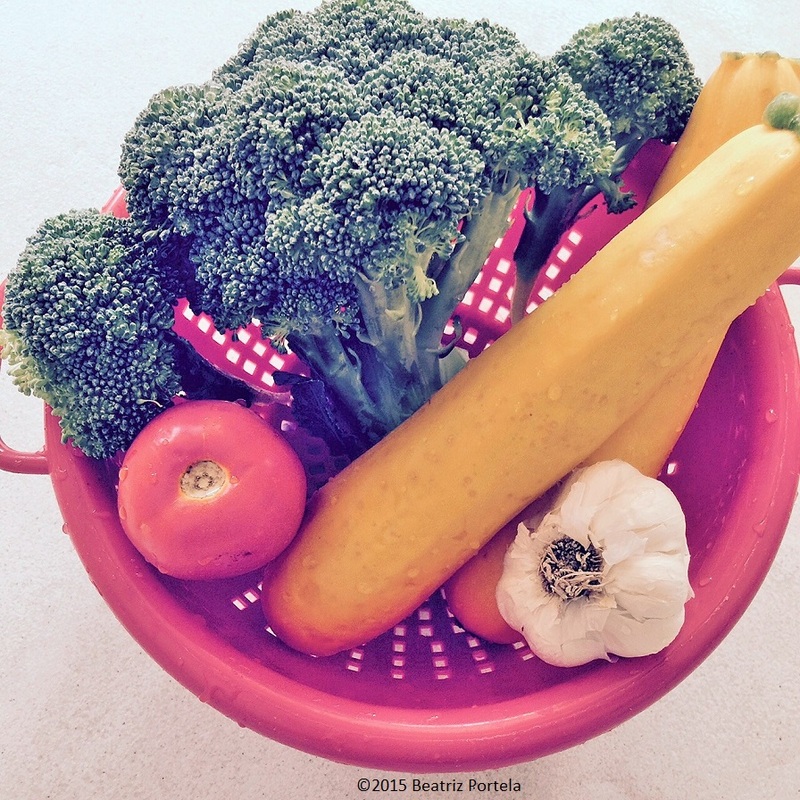 Prep: Cut Broccoli into bite-size pieces, dice 4 to 6 Garlic cloves, Julienne or Spiralizer Yellow Squash, cut Tomatoes into thin slices then cut those into halves, mince Red Pepper if using fresh. Sauté Broccoli & Garlic in a little oil until Broccoli is al dente (still crunchy). Mix Squash “noodles” into Broccoli/Garlic and continue sautéing for approx. 10 minutes, or to desired consistency. If using minced Red Pepper add it along with the Squash. Mix in Tomatoes & take off heat. Add Salt and/or Black Pepper, if desired. If using crushed DRIED Red Pepper, add it now. 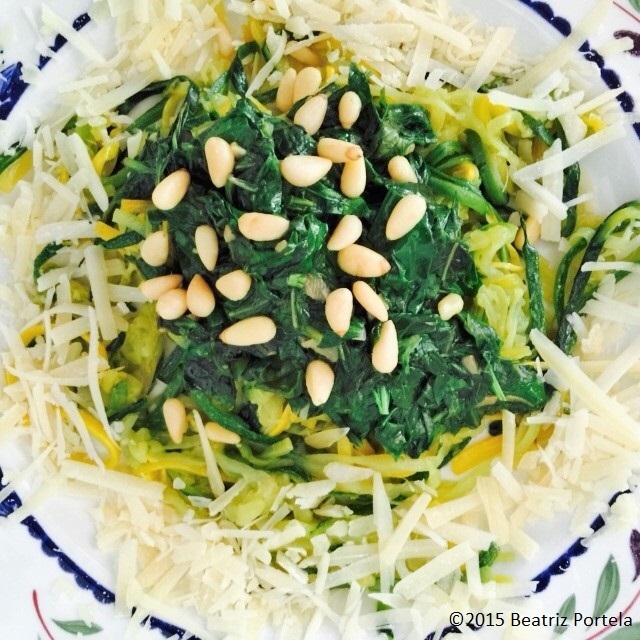 This is the conclusion of the Zoodles/Squoodles Pasta War I reported about yesterday. Notice that I listed Zoodles first, before Squoodles. This was intentional. If you look online you will see that Zoodles usually get top billing. I’m not sure why but I decided to follow this standard, just in case there is a good reason for it. To make this dish, I julienned the zucchini and squash with my new “Heart Peeler.” Every gizmo has a gimmick! This gadget came in a nifty package with pictures of all the amazing things it can do. Of course it has its own Facebook page and website for fans to further worship at the altar of the peeler. To its credit, it did do what it was supposed to do. My zoodles/squoodles came out great. For raw food fans, the noodles can be eaten uncooked, which I will try the next time. This time, I sautéed the noodles with a little oil, before topping them with a home-made pesto sauce. Since the noodles have a high water content, they did get a little mushy when I sautéed them but they tasted delish. Pesto is very easy to make. Just mix together in a food processor or blender: 2 cups packed fresh basil leaves, 2 cloves garlic, 1/4 cup pine nuts and 2/3 cup extra-virgin olive oil. To this add fresh pepper and salt if you want. This is what is generally considered a “traditional” recipe. The purists eat pesto raw. I prefer to mince the garlic and sauté it lightly in oil first, then I toss chopped fresh basil from my garden into the sauce pan. It’s a little gentler on the stomach (and breath) if the garlic’s cooked a little. In this dish, I sprinkled the pine nuts on the top rather than mincing them into the sauce; and I shredded parmesan cheese along the perimeter of the plate to make it pretty. For those that don’t eat dairy, just omit the cheese. So, do I like the zucchini & squash noodles as much as conventional wheat noodles? Sure do. Zucchini is battling traditional wheat pasta in a NOODLE HOLY WAR. Have you noticed that everywhere you look someone is talking about “spiraling” zucchini to make a pasta dish? 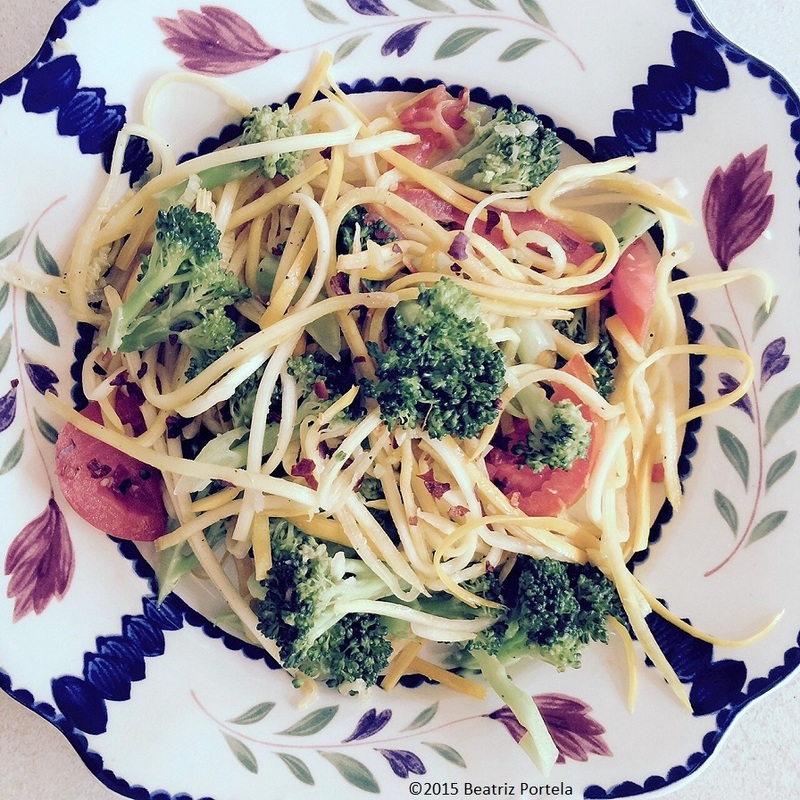 I went online to look up recipes and discovered zucchini noodles even have a name: zoodles! And noodles made out of squash are… squoodles! Is it me or does this seem a little undignified?! I’m old school. I like the romance of sitting down to an Italian dinner, with an Italian wine, a hot heaping helping of pasta with pesto or primavera or pomodoro sauce… the waiter coming over with a chunk of parmesan to dice over the dish and the big pepper grinder under his arm… Now rewind this scenario and when the waiter comes over you order a plate of zoodles & squoodles. Seriously?! And then this “spiralizer” thing? Does it cut the noodles like curly fries? I’m not sure I want curly noodles. There’s an entire business built around this… all kinds of spiralizers on sale now. When did this start happening? Where was I? Do we really need to spiralize noodles? When you go to a restaurant would you order your noodles spiralized, or if you are more of a purist would you say, “I’ll have my noodles straight up?” Sorry but I am not ready to join the church of spiralizing yet. I do like to eat healthy so when I saw this guy giving a demonstration of how to julienne a zucchini at an outdoor festival, I bought the little gismo he was selling. Now I was ready to dip my toe into this new religion of zoodles & squoodles. I julienned one zucchini and one squash with the new gadget. As you can see in the picture they looked great. I was very proud. Then I sautéed the noodles with a little oil, before topping them with a home-made pesto sauce. I will admit that the final dish tasted delicious. I hope my Italian friends don’t get mad at me. Please don’t hurt me! (Stay tuned for my pesto recipe & finished dish photo in my next post).